Professor Dr. Marc Vanderhaeghen has been appointed a Fellow of the American Physical Society (APS). This is a prestigious distinction given for outstanding scientific achievements. By granting this distinction, the APS is honoring Vanderhaeghen's extraordinary achievements in physics. He has made groundbreaking contributions to two-photon physics and has conducted fundamental research on the internal structure of baryons. 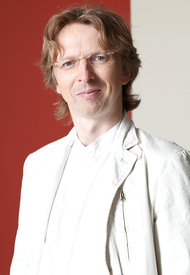 Since 2008, Marc Vanderhaeghen has been a professor at the Institute of Nuclear Physics at Johannes Gutenberg University Mainz (JGU). His core research interests in the institute's theory group are in the field of quantum chromodynamics, generalized parton distributions, two-photon exchange processes, real and virtual Compton scattering, and symmetry predictions of electromagnetic processes. The American Physical Society with its more than 50,000 members is the second largest scientific society of physicists after the German Physics Society (Deutsche Physikalische Gesellschaft / DPG). The APS was founded in 1899 with the aim of promoting the physical sciences and making them more widely studied. The society awards fellowships to at most 0.5 percent of its total members in any one year, meaning that it has 250 fellows at present. It is considered a great honor to be selected for a fellowship, as those eligible are assessed by a peer review. Scientists who make major contributions to theoretical research or develop important scientific or technological applications are eligible for a fellowship.